Kitchen Solutions is a Western Australian family owned and operated cabinet making company that is committed to quality and personal service. 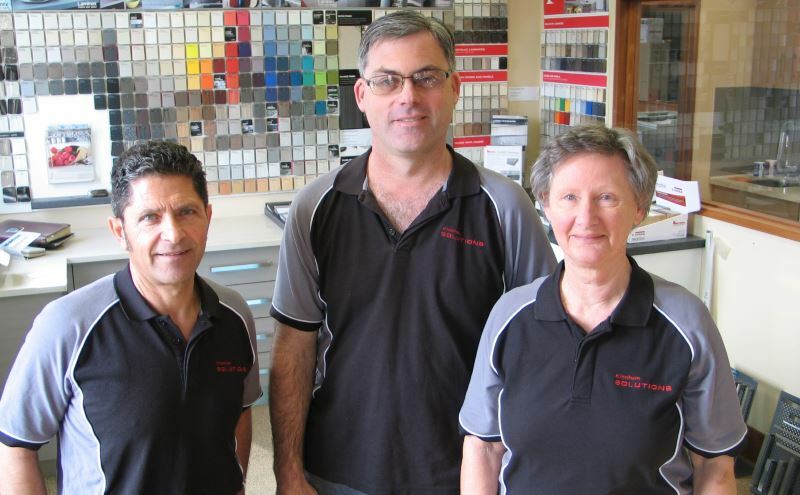 Established in 1996 we have now relocated to a purpose built factory in Bibra Lake allowing quality control over all aspects of the cabinet making process. We specialize in all types of kitchen, bathroom, laundry and alfresco renovations, as well as manufacturing cabinets for new homes. Structural alterations are included if required. From design to complete installation including trades our comprehensive service gives you custom designed, ergonomic and stylish solutions which are aesthetically pleasing. You can choose from an extensive range of quality products to create the style of your choice and we will work with you to achieve the best possible outcome and complete satisfaction. Few places in your home allow as much room for dramatic changes as your kitchen. Is an old kitchen making you work harder than necessary, or would you just like a fresh new look? Kitchen Solutions can take the stress out of your kitchen renovations and deliver a room you will instantly fall in love with. The kitchen is the heart of your home, and you deserve a design that will bring you joy every time you enter it. Here are some of the elements that will have the greatest impact on your kitchen. Floors: Ceramic tile, wood flooring or something else completely? They all have their own share of advantages and disadvantages, so you will want to discuss them thoroughly with a professional. Fortunately, there are a number of durable low-maintenance options for kitchen floors that won’t break the bank. Countertops: There is nothing in a kitchen that will draw the eyes faster than exquisite countertops. This feature is usually at the top of the list for homebuyers, so a bit of a splurge here will likely add to the resale value of your home. There is no lack of choice, so you should be able to find a product, which will suit both your décor and budget. Appliances: New appliances are more energy-efficient, so they can actually help you save money in the long run. This category is very easy to pick and choose where you want to spend and where you want to save. If your heart is set on that high-tech range, then maybe you won’t mind basic models for your dishwasher and refrigerator. Lighting: You may be astounded at how important lighting is. Yes, one fabulous fixture over the kitchen table may be lovely to behold, but you should also want to have functional lighting over your work area and comfortable lighting for the room as a whole. Cabinets: Style is important, but storage is crucial. Make sure you are getting enough and the right kind. It sometimes helps to imagine your daily routine…oh yes, where is the kitchen rubbish bin going to go? It can actually be hidden is special cabinet solutions! Looking at options in magazines or online can be helpful, in order to get an idea of the features you might like to have in your new kitchen. However, professionals have a great deal of knowledge that you will find vital in creating a kitchen of your dreams. If you are a bit overwhelmed at the thought of all the pieces that go into a full kitchen renovation, or even a partial one, then let Kitchen Solutions handle them for you. There is no reason why you should have to co-ordinate plumbers, electricians and installers when the Kitchen Solutions team can do it all for you flawlessly. The Kitchen Solutions team will give you all the information you need to make informed decisions and help guide you to a kitchen you will enjoy cooking in. Kitchen Solutions does more than create impressive kitchens. We also perform exquisite bathroom renovations! Do you want your bathroom to be a sanctuary in which to linger joyfully, or an efficient area to perform your daily rituals? There’s no reason it can’t be both. If you would love to make your dream bathroom a reality, but are afraid of the cost and the mess, then set your mind at rest. Adding quality touches to a small room can be more affordable than you might realize. And the experts at Kitchen Solutions will manage the entire process seamlessly–from start to end. Is poor bathroom lighting making your life a misery? How can you get ready for work in the morning when you can barely see to safely shave or put on makeup without garish results? Do you have such inefficient storage that everything is jumbled together, wasting your time and energy on a daily basis? No one realizes the value of proper storage solutions more than those who don’t have any. Kitchen solutions can create a design that gives you what you need to make your bathroom an asset to your daily routine, rather than a hindrance. While it may require the relocation of major fixtures, it’s always possible that simple replacement will suffice, or even just new décor. The experienced professionals at Kitchen Solutions can figure out what you need and create a design with the best solutions available within your budget. You might be astonished at how little it takes to turn a humdrum bathroom into a sensational space. Even giving your bathroom a full makeover may not require completely gutting it and starting from scratch. If it does, then you definitely want the expert team from Kitchen Solutions handling all the fine details..
For instance, adding a special flooring design just to a small area in front of the tub could brighten the whole floor; a new coat of paint and a couple of eye-catching light fixtures could have major impact. Even replacing fixtures allows you to choose where you want to splurge. Perhaps, you will be quite happy with medium range vanity counter tops if that will allow you to have the rain shower you covet. Whether you need a full bathroom renovation or a simple cosmetic makeover, Kitchen Solutions can create a bathroom you will love, within a budget you can afford. They will also supervise all of the plumbers, painters, installers and anyone else who will be involved in the transformation of your new bathroom. Call Kitchen Solutions today at (08) 9418 7555, to find out how you can get stress-free quality bathroom renovations at affordable prices. Let us create a bathroom that will add both efficiency and joy to your daily routines.